Increasing WBCU efficiency has so far been about combining tools to reduce runs. We identified a demand in the market for a scraper tool to run in a drill string, but the solutions available were far from optimal. Our clients want to save time and reduce runs as well as take advantage of the rotation, reciprocation and circulation while cleaning the well. We needed to design a casing scraper that could withstand the rigors of the drilling environment while functioning the same way as a conventional scraper. Our main enemy was torque, in particular the trend towards higher strength drill pipe and connections. To overcome these challenges, we had to move towards a more robust design, leaving behind the traditional block style scraper pads that had become standard in industry. There is a saying that form follows function, and in this case the solution proved to be both robust and elegant. 3D CAD and the FEA packages are fantastic tools to predict the behavior of complex shapes, such as our tool body, under stress. And while a good solution presents itself on CAD, manufacturing may not be easy. Our machine shop vendors ran into challenges when figuring out how to machine our uniquely shaped tool. It took a lot of cooperation to design, analyze, verify – then move on. Despite the challenges, the time from concept description to testing and delivery of the first batch was only six months. We were, of course, very excited to test out the DrillRdillo™ in a real life application. We ran field trials on two identical wells in order to establish a comparison. 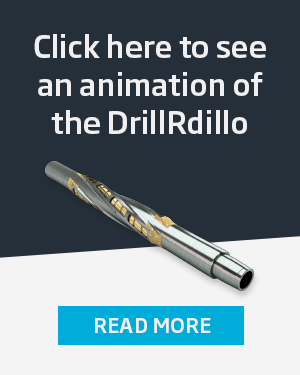 In one well we ran our conventional WBCU tools and in the other the new DrillRdillo™. The DrillRdillo™ functioned as planned, the packer was set first time and one trip was saved. The identical offset well was outperformed by an impressive 16,5 hours. More time could have been saved, but bad weather caused some delay. Significant debris was collected from the well, and we concluded that the DrillRdillo delivered benefits without compromising clean-up efficiency, needless to say, to client’s appreciation. Todays market dictates a new level of cost-effectiveness in wellbore delivery. Operators who want to save money have to save time. A fully dedicated WBCU run with a comprehensive BHA is an operation lasting 24 or more hours. A focused and combined DrillRdillo™ clean-up will reduce this to a few hours at most, an imperative for the operator who want to deliver wells at the current oil price. To that end we shall continue to expand the range and develop new technology to ensure our customers can take advantage of lower well delivery cost. This oil price slump cannot last forever, but once it does end, we believe the appetite for cost savings will prevail lest we forget the lessons we have learned.